Run Hadoop Mapreduce jobs using Hadoop Streaming. 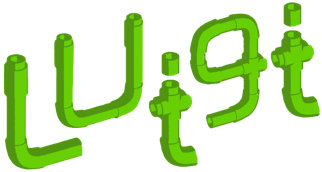 To run a job, you need to subclass luigi.contrib.hadoop.JobTask and implement a mapper and reducer methods. See Example – Top Artists for an example of how to run a Hadoop job. Attach a python package to hadoop map reduce tarballs to make those packages available on the hadoop cluster. Create a tar archive which will contain the files for the packages listed in packages. A simple generator which flattens a sequence. Only one level is flattened. Runs the job by invoking the command from the given arglist. Finds tracking urls from the output and attempts to fetch errors using those urls if the job fails. Throws HadoopJobError with information about the error (including stdout and stderr from the process) on failure and returns normally otherwise. Uses mechanize to fetch the actual task logs from the task tracker. This is highly opportunistic, and we might not succeed. So we set a low timeout and hope it works. If it does not, it’s not the end of the world. Takes care of uploading & executing a Hadoop job using Hadoop streaming. TODO: add code to support Elastic Mapreduce (using boto) and local execution. The default job runner just reads from config and sets stuff. Will run the job locally. This is useful for debugging and also unit testing. Tries to mimic Hadoop Streaming. Implement any work to setup any internal datastructure etc here. You can add extra input using the requires_local/input_local methods. Anything you set on the object will be pickled and available on the Hadoop nodes. Default impl - override this method if you need any local input to be accessible in init(). This method gets called if an exception is raised in run(). The returned value of this method is json encoded and sent to the scheduler as the expl argument. Its string representation will be used as the body of the error email sent out if any. Get the MapReduce runner for this job. If all outputs are HdfsTargets, the DefaultHadoopJobRunner will be used. Otherwise, the LocalJobRunner which streams all data through the local machine will be used (great for testing). Reader is a method which iterates over input lines and outputs records. The default implementation yields one argument containing the line for each line in the input. Writer format is a method which iterates over the output records from the reducer and formats them for output. The default implementation outputs tab separated items. Re-define to process an input item (usually a line of input data). Defaults to identity mapper that sends all lines to the same reducer. Since counters can be a bit slow to update, this batches the updates. Can be overriden in subclass. Each element is either a string, or a pair of two strings (src, dst). src can be a directory (in which case everything will be copied recursively). Uses Hadoop’s -files option so that the same file is reused across tasks. Extra arguments to Hadoop command line. Return here a list of (parameter, value) tuples. Run the mapper on the hadoop node. Run the reducer on the hadoop node. Reader which uses python eval on each part of a tab separated string. Yields a tuple of python objects. Writer which outputs the python repr for each item.